Can this possibly be the perfect bedroom? Let’s talk about the color. This bedroom has the ever so popular gray wall. It’s modernized by adding a touch of yet another gray that has the slightest hint of a muted lavender. It’s pleasing to both men and women because this color palette falls right smack in the middle of the appeal for both sexes. The black adds a nice masculinity and grounding to the room shown in the strong stripe of the area rug and gorgeous texture in the frames. The hard lines of the end tables are softened by soft white fabrics and an undulated headboard which add femininity to this space. Sleepy yet? 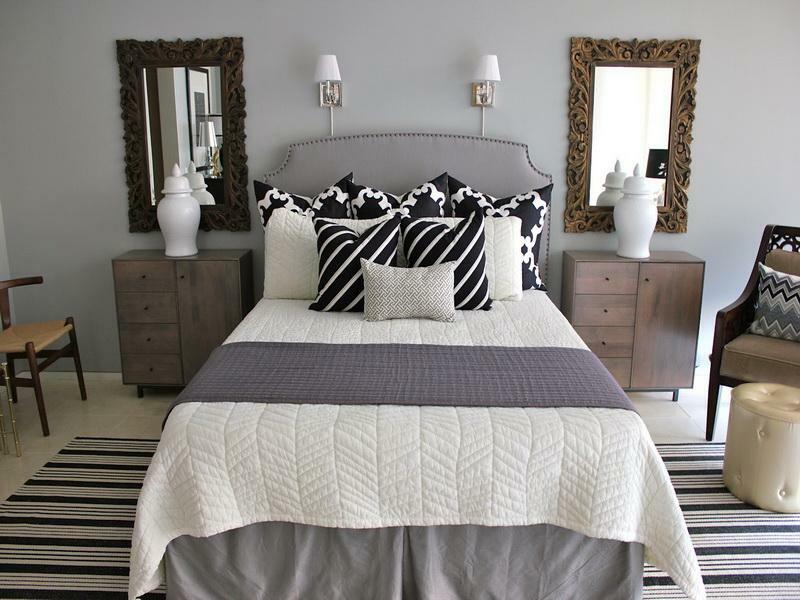 This entry was posted in Bedroom Colors and tagged bedroom colors, soothing bedroom. Bookmark the permalink. Great layers of colour! The hint of violet really adds another dimension to the grey walls. One of my favourite shades is Benjamin Moore Portland Gray.